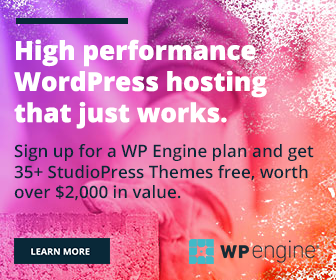 Is WordPress just installed on your site? A WordPress site comes with an Administrator account by default. It is the most powerful role in a single site who is able to manage themes, plugins, posts, pages and everything else. No firm will complete with a manager post alone. We may need co-workers, clients and customers for the smooth functioning of a business. In the same way, you are able to add users in WordPress and their capabilities differ based on the user roles assigned. If you are new to WordPress, let us check how to create and manage users on the site. Sign in to your WordPress site using Administrative privileges and open Users menu from the left sidebar and click on Add New. Enter the username for the desired user which can’t change later. Type his email address. Check the second last option, Send User Notification, to inform the person about account creation and credentials. What is his role in the website? There are five different user roles in WordPress. Administrator: He has full control over a single site. The user with administrative abilities can add and remove users, write contents, install and remove themes, install and remove plugins, upload files and even delete the site. Editor: The user with editorial power can publish and manage all posts including that of others. Author: This user can publish and manage own posts only. Contributor: This user can write and manage own posts but cannot publish them. Subscriber: This user is able to manage own profile and read site contents. The following table will give you more knowledge about the user capabilities. There will be one more user role in multisite installations, known as Super Admin. This user enjoys all capabilities of a single site administrator and that of network sites. Manage network users, plugins, themes and options. 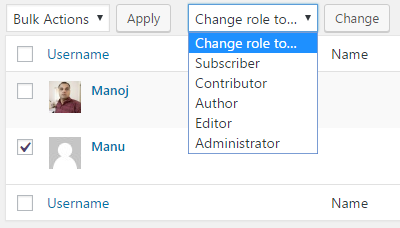 Anytime, you can change the role of a user in WordPress. Open Users menu from the left sidebar and click on All users. Select the user and tap Change role to dropdown box from the top to show all user roles. Choose a role and hit Change button. Done. To delete a user, mouse hovers the username to show delete option. Otherwise, select the user and tap Bulk Actions dropdown box. Choose delete and Apply. Then, WordPress will ask you on how to deal with that user’s contents. You can either delete them or assign to the existing users. Select your option and click on Confirm deletion button to remove the user. Are you trying to reset a user password? Open the user profile for whom you want to reset the password, from Users > All Users. Scroll down to bottom, until you locate Generate Password button. Click to change the password. A new password will be shown in the same place, note down and inform the user about the change. Don’t forget to tap Update User button at the bottom before leaving the page.